We're down to eight squads, but here are the best ones you can use in the game. World Cup madness continues to grow worldwide, even with the defeat of the United States earlier this week. No matter - there are soccer fans who clearly appreciate the sport, whether they're watching or playing EA Sports' FIFA 14 on their favorite mobile devices. In case you're missing out - or you just need a primer on the right squad to select - we have five suggestions for who to play with. Even if these countries aren't normally your cup of tea, they're guaranteed to give you the scoring advantage you need. If any team has emerged as a surprise contender in this World Cup, it's Germany. The team doesn't always look championship caliber in its matches, but it's continued to be persistent against its opponents, thus landing a spot in the final eight. The team as a whole shows a great deal of balance, both in the real tournament and the game, with various ways to get to the goal and defensive tactics to keep the ball moving on the field. In the thick of things - and winning a championship - that's truly what counts. A team that managed to show dominance since entering the World Cup, Colombia is easily one of those squads that could take the championship with flying colors. In its last games in the group stage, it managed to outscore teams 11-2. The squad, led by James Rodrigues, Jackson Martinez and Juan Cuadrado, had no problem hustling on the field and getting the ball into the net. They're also good on the defensive end as well, so make sure you give them a try in-game. What France lacks in superstar skills, it makes up for consistency and energy. The team has done a great job of upsetting teams throughout the World Cup, making them a powerhouse player in EA's soccer sim. The team dominated the past couple of weeks, with Karim Benzema and Mathieu Valbuena leading huge scoring drives, and Paul Pogba keeping up in midfield. They did struggle a bit against Nigeria for a while, but there's no question this team has heart. Brazil is easily a household name in soccer, as it dominated championships for years. It shouldn't be a surprise that it made its way into the top eight, despite a somewhat average performance against certain squads. However, when it comes to playing for the World Cup, there's no doubt the team will inject everything it can into its performance. 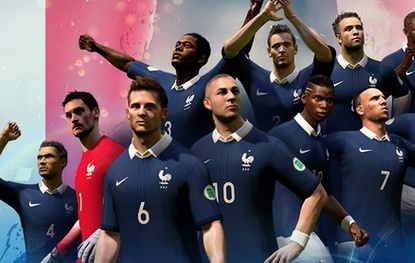 The team is an ideal choice for play in FIFA 14, especially when it comes to maintaining solid defense around the goal and charging for a tying - or winning - opportunity. Look for these guys to last a while in this next round. A team few didn't think would make it (save for a miracle goal against Mexico in the Round of 16), the Netherlands could be one of the biggest surprises of this upcoming tournament. Even without Nigel de Jong leading the charge, there are still plenty of great players on hand, including Wesley Sneijder and Robin van Persie. They're represented well in the game, with plenty of strategies to take advantage of, and the opportunity to steal wins with just the right plays. Who knows, they might just do the same in the World Cup.